This page shows an example of a rain leak report. We also often put in example photos of how a standard repair might look into the report so you have an idea of how to fix the problem if the repair is a bit more technical than the one shown below. A Division of Haydon and Associates Inc. Here is a report for the leak finding you requested at the above address which had water in the light fixture in the dining room during recent rains. 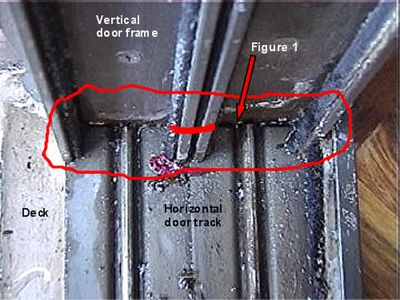 Figure 1 shows an opening between the horizontal door track and the vertical door frame. This gap allows water into the dining room light fixture downstairs. As you can see, there is an insufficient seal between the 2 and needs to be standardly sealed. 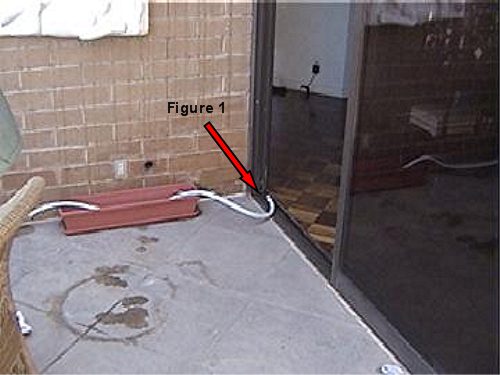 When water was applied to the deck only, the water stopped coming in the light fixture below and indicates the deck itself at least in this area is not a leak source at the time of testing. I suggest you remove the metal partition from the thick red line down to the horizontal track so you can effectively get to the entire joint of the door frame to door track. Clean the joint between the vertical door frame and the door track and standardly seal this entire joint. Thank you for using my services. I trust they will help. Remember, there may be other sources but this is a factual point of entry that MUST be fixed at the very least as it is a factual leak source. Keep your eye open in the next rains and let me know. If you still have water coming in around this area it means either the repair was not standard, or there is another source or sources that ALSO have to be isolated and ALSO have to be terminated.